Probably the Lakers will recover. They’re the Lakers. Anyway, judging by the vaguely bitchy tweets, he wasn’t actually doing all that much work in the first place, and judging by the results of the past two-plus years, he may not have been very good at it. Still, it’s hard to imagine a colder or more casually devastating blow against whatever’s left of the mystique of the Los Angeles Lakers than for Magic Johnson, still and probably forever the Laker, to quit the team president job on a whim on a Tuesday evening, because, basically, it’s more fun and rewarding to just be a retired rich guy watching basketball on TV. “I have a beautiful life,” he said, out loud, to reporters, in the impromptu press availability during which he told them about his resignation before he’d even told his boss, Jeanie Buss. “And I’m going to go back to that beautiful life.” The beautiful life of not running the NBA’s flagship franchise. That’s cold! Okay, yes, there do appear to be some specific and less delicious reasons for his departure, too. Parsing the press scrum and the tweets from various scrambling reporters, it sounds like Magic didn’t want to be the hatchet guy on coach Luke Walton’s firing, out of some combination of pity for Walton and a desire not to harm his own close personal friendship with Buss, who’s reportedly been Walton’s champion within the organization since his hiring in 2016. In addition, Magic indicated he’d grown tired of the accusations of skullduggery and conspiracy that flooded his way in the aftermath of every doofusy expression of enthusiasm for this or that league star; it sounded like he’d been genuinely bothered by February’s Ben Simmons affair, when Magic geeked out to Philadelphia media about the possibility of mentoring the 76ers’ wunderkind over the summer and the league responded by launching a tampering investigation. (He ultimately was cleared.) Talking about the job and his reasons for leaving it, Magic seemed unhappy and worn out. These are fine, well-adjusted reasons to quit a job! They’re also jarringly minor-seeming reasons to parachute out of what, up until last night anyway, sure as hell seemed like the most glamorous and desirable front-office job in all of American sports. He wasn’t even the general manager! He didn’t even have to deal with the fine granular weirdnesses of the collective bargaining agreement and salary cap. That was/is Rob Pelinka’s job, for now at least. Magic, by all reports, was the part-timer who got paid to sail into the office once in a while and go “It’d be cool to have Giannis Antetokounmpo on our team.” And he quit because it’d be more fun to have that opinion on Twitter than in the most powerful management position shy of commissioner. With that in mind, it’s not clear exactly how much the Lakers are losing here, at least in strictly functional terms. Under Magic’s reportedly pretty hands-off stewardship, the Lakers scored LeBron James in free agency, a move popularly credited at least in large part to Magic’s presence and well-deserved legend; it seemed possible at that moment that the franchise had recovered from the fallow late- and post-Kobe years, when even Dwight friggin’ Howard took a pay cut to go to Houston rather than stay in Los Angeles. But the Lakers struck out on Paul George and couldn’t swing trades for either Kawhi Leonard or Anthony Davis, and the bad idea to build this season’s hilariously misbegotten supporting cast out of run-down old farts and shook, not-ready-for-prime-time teens appears to have been, or at least was sold to the public as, LeBron’s and Magic’s shared brainchild. He fronted and bungled the end of D’Angelo Russell’s time in L.A., badmouthing Russell on the way out the door, as well as the beginning of Lonzo Ball’s, badly overselling what could be expected—or how soon to expect it—of a limited young player with a high developmental floor but what appears to be a pretty low ceiling. It certainly seems like he and Walton never got on the same page; the coach came aboard expecting that he’d be nursing along a young core in the mold of the Golden State Warriors, while Johnson, by signing 33-year-old LeBron and the Suicide Squad, seemed to commit the team to a much shorter timeline for contention. And whatever specific role he had in this past winter’s Anthony Davis trade fiasco, it was a big ol’ mess. Again: Pelinka was the GM for all of this. (Speaking of which, Adrian Wojnarowski’s tweet about how Magic “didn’t do a lot of scouting” seems pretty silly. How many NBA team presidents with GMs working under them are expected to “do a lot of scouting”?) 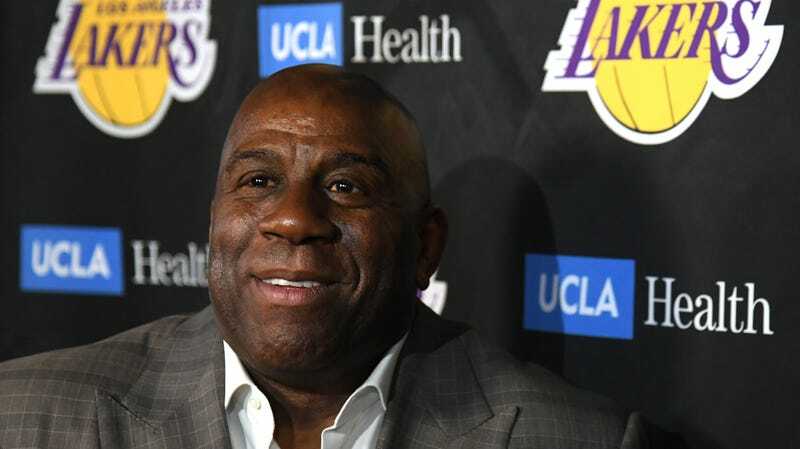 But however Magic fit in, his presence certainly did not produce a smooth-running operation, and they weren’t able to capitalize on however much gravity the combination of him, LeBron, and the Lakers franchise itself seems like it ought to exert. Even so. His announcement last night, especially for the fact that he’s leaving the Lakers because of an affirmative preference for doing nothing in particular, places Magic as the latest, grimmest, and funniest iteration of a grim and funny pattern: The baggage of the Lakers franchise outweighing its magnetism for people who have the freedom to choose some other destination, job, or (in this case) pastime. In a salary-capped and luxury-taxed league where even they can’t just buy the team they want, that fabled magnetism is one of the Lakers’ chief resources; the fear of it, renewed by LeBron’s arrival in L.A., is why rival organizations hunched over their own homegrown stars and spit charges of tampering over their shoulders every time Magic tossed off a quote about how he thinks Buddy Hield has a cool-looking jumpshot. That magnetism is looking pretty tattered at the moment. Maybe over the next couple offseasons the Lakers will score Leonard and Davis and reassert themselves as the irresistible gravitational center of the sport. The alternative is looking sadder and more hilarious by the day: LeBron playing out the end of his career not as the guy who returned the Lakers to relevance, but as the tragic dumbass who buried his own in a purple-and-gold coffin. Whatever happens, you won’t have to wonder what the most beloved Laker of all time thinks about it, though; he’ll be free to say it as loudly as he likes, having chosen his couch.